I had a tablet for a little while. Lenovo. Really liked it. And once I got used to using it with the pen and hand writing it was actually very accurate at converting it to type. For a little while I tried to use it for hand written notes to replace my notepads but undocking and carrying the tablet was a pain and obviously caused a few stares and raised eyebrows. So it was abandoned and I fell back to using notepads. I mean the using it as a notepad was abandoned but I obviously continued using it as a laptop! It just wasn’t suitable to replace the trusty notepad and pen on a permanent basis. I have to admit I am not good at writing notes in meetings or during my work day. Actually quite poor as once I get caught up in the conversation or work I forget to write. However I do like to reflect on the meeting, the day or the weeks happenings during a journey, when at home or generally anywhere outside of the office once I get some quite time. Most plans and tasks generally start out on paper before getting converted into some type of electronic format. That is not exactly mind blowing stuff and I am sure there are lots of people with similar habits but paper remained a big part of my process in planning my days and reflecting on work. Being paperless is obviously more than losing just a notepad in your bag. In work as a team we have put the majority of paper items that exist in our day to day work into some type of electronic system somewhere such as task and project lists, reports, contracts, invoices, etc. So most things are accessed in electronic format only. Sure you can never go truly paperless but you can try to eliminate what makes sense. The other paper in normal life such as books, newspapers and magazines I already get on the iPad. So paper was all but gone. The only paper left was my A4 notepad for hand written notes. I carried it always. For a while i carried it with my laptop and iPad. Once I got comfortable with the iPad I carried my notepad and iPad only. The laptop stayed mostly in it’s docking station. This week however the iPad has been alone and unaccompanied in my bag. The paper notepad is gone. Replaced by an app called Penultimate and a writing pen called Pogo sketch. 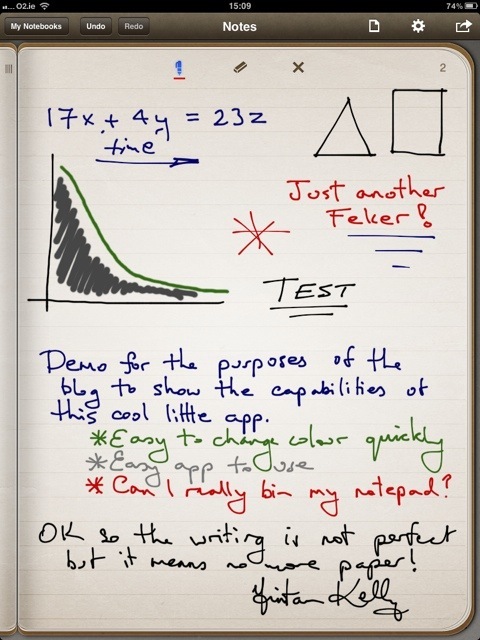 There are more complex apps for writing i tried like notes plus but I like this one as it’s very simple (queue the smart comments). It’s very quick and easy to use. OK so the writing experience on the iPad is not quite the same as using a nice pen and paper and because of the touch requirements of the iPad it’s hard to be super accurate but so far it has worked for me. It means the journeys now to and from work with the once heavily laden bag with newspaper, magazine(s), book, notepad, laptop, charger, broadband dongle, iphone and misc cables has been reduced to simply ear phones, charger cable, iphone and iPad. A very nice change over a very short period of time. If this works out the iPad will have succeeded in helping me go completely paperless. It will have all my paper – books, newspaper, magazines, photos and finally my hand written notes contained within it’s wonderful little interior. Note that I don’t mention anything about saving trees or other green reasons for this. The primary reason is a bag with one small device that has everything I need compared to a very heavy bag with 8 bulky things is my driving motivation. I can’t say that I know a combination of paper items is less green than an iPad as an iPad has rare earth elements that I know are hard to get due to the required extraction processes via mining operations that are often not ‘earth friendly’. Maybe over it’s life the iPad is the better option and the greener option but I don’t know. You can always plant a new tree. You can’t plant a new piece of Lanthanum or Europium. However I do know that I like my new light bag and accessing everything on 1 item. And I can hope that it’s greener and the better option for the planet. ← Damn but it’s a wonderful piece of tech! How long until this is the norm in classrooms? 10 years? I hope it’s before 10 years. A school in Mayo is already starting I believe. Carrying that instead of all those books would be much appreciated by them let alone all the extras it offers :-) plus for teachers you can plug them in to screens for displaying so it could be a great teacher tool also! Maybe you can put a case together for your school to be a test area for them! If only I have stumbled upon this blog post earlier, I would have had a nicer presentation of my research on going paperless the other week. Still, this post is a great reference. is that it’s much less weak to catastrophic, massive-scale disruption.